Photo by Jennifer Fumiko Cahill Charcuterie deep cuts. 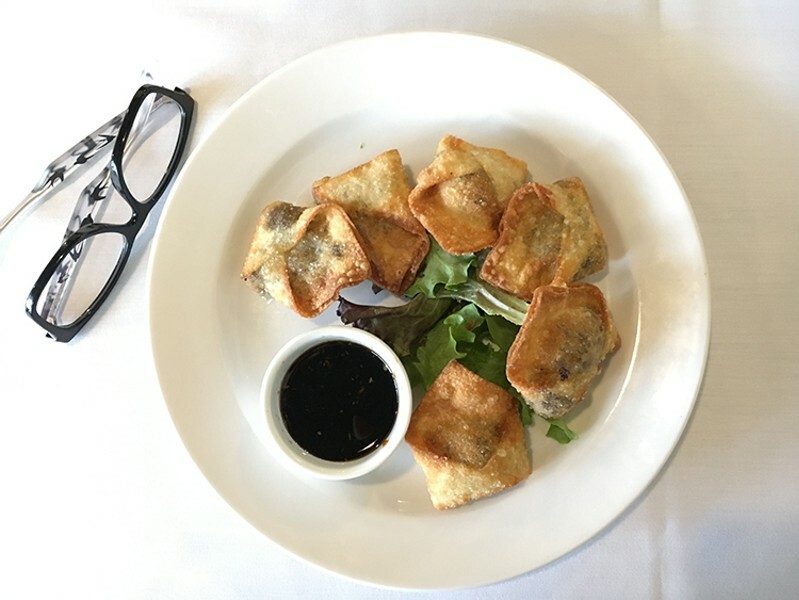 Photo by Jennifer Fumiko Cahill Crispy elk wontons worth the leap. Photo by Jennifer Fumiko Cahill The brie and honey runneth over. Here's what we're ordering seconds of this month. If you've got a tip on good food around the county, don't keep it a secret, let us know and we'll investigate. Somewhere in Los Angeles, a restaurant owner is poring over reclaimed barn wood samples and polishing the hell out of a concrete floor to achieve a rustic farm vibe to go with his or her artisanal meats. Godspeed. No such staging required at The Boardroom (3750 Harris St., Eureka), though the redwood slab counters don't hurt. 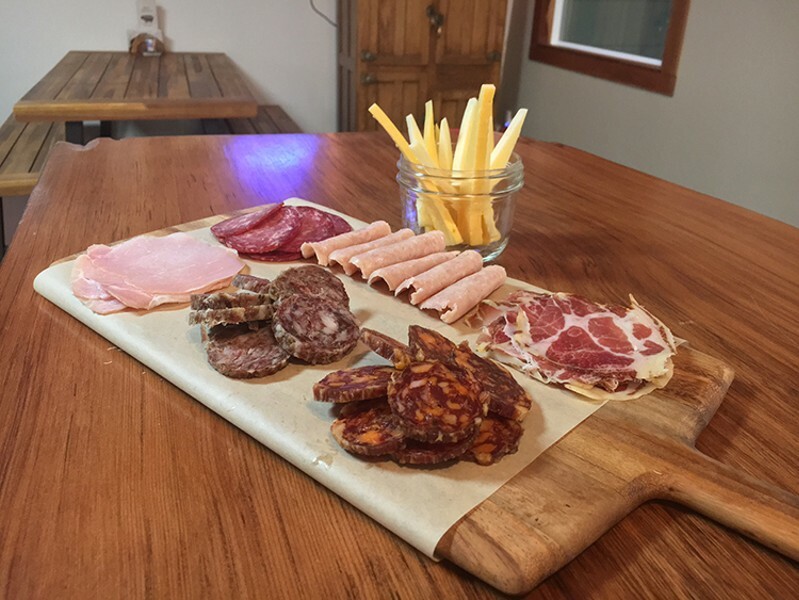 The tasting room for Ryan Creek Root Cellar's charcuterie (made there in the back) is but a quick trot from the Cow Palace and the arena where prize pigs are judged every year at Redwood Acres Fairgrounds. That's farm cred. 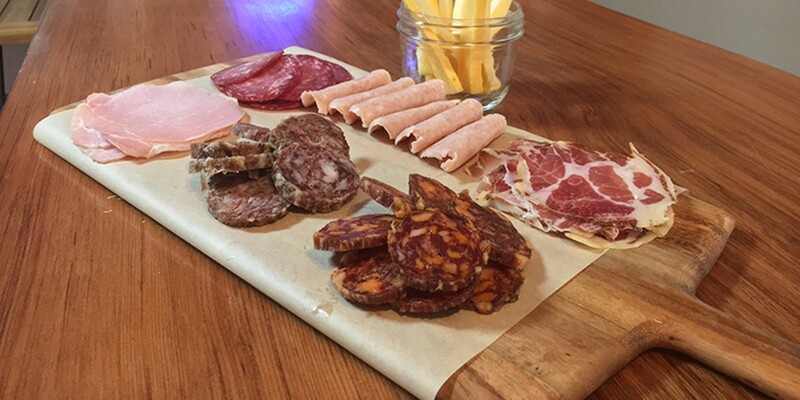 There's room to roam and graze among the cutting boards of sliced sausages, pickles and cured meats. There's also a respectable selection of beer on tap, in bottles and canned (even Hamm's for the nostalgic) and a handful of fancy sodas, wine and cider. Hours are limited — it's open from 5 to 10:30 p.m. Thursdays and Fridays, and 3 to 10:30 p.m. on Saturdays. Board No. 5, the "meat flight," is stacked with nearly everything ($15) into which we swapped spears of aged cheddar and Edam for the pickles. The salamis, one warmly spiced with red pepper and the other sagey as Thanksgiving stuffing, are dotted with globes of fat. The dry-aged pork shoulder coppa, with its fat in melting streaks and loops, is a deeper, richer choice for prosciutto lovers. The summer sausage, or gothaer, comes as a nice earthy, peppery surprise for those of us who recall the rubbery mass market variety from gift baskets of yore. Simpler and saltier were the pale pink petals of lean Canadian bacon and the chicken mortadella, which, being wetter and mealier, was the only thing left behind on the board. Small plate No. 3 ($9) is a vinegary dive into the house jardinerè — a little jar of tart and crunchy cauliflower, sweet peppers and is that zucchini? — surrounded by a Ziegfeld Follies ring of firm pickled eggs in beet fuchsia and turmeric yellow. The tart zing is not a bad note to end on, nor was the last translucent slice of coppa everyone else was too shy to swipe. When the erstwhile bistro Zoe's newly installed wood fire oven went cold, it seemed that once again you could find anything in Henderson Center (coffee, bike repairs, mole, a haircut, a drink, Japanese kitchen gadgets, Lao rice cakes) except a starched white tablecloth. Then Le Monde (2850 F St., Eureka), a French venture by chef Alex Begovic of Uniquely Yours Catering, popped up in the renovated space, snapping out the linens. The enormous Elizabeth Berrien wire tree has been replaced by black and white photos of family in France, Matt Beard paintings on the opposite wall and a few sound absorbent panels to take the edge off the echo in the large space. Easy enough to split a plate of elk wontons ($12). It's a leap of faith — if you've been burned by limp dumplings or, god forbid, bland kimchee at a French place dipping its toes into miscellaneous Asian flavors, those scars are real. The risk is rewarded here with crunchy envelopes loosely packed with enough flavorful ground meat to stand up to a housemade Chinese five spice and an equally fragrant soy and honey dipping sauce. The menu touts duck leg confit ($19) from a family recipe, and how do you refuse that with the ancestors themselves looking down at you from the wall? It arrives browned and glistening, the meat firm and rich from a round of salt curing and cooking low and slow in its own fat. Be warned that if you peel away the soft, delicious skin and leave it on your plate I will know and I will judge you with the same stern expression as the French men in the photograph. The duck sits atop a mound of mashed tiny purple potatoes, some of which are still whole in their pleasantly mineral skins. Do we even recognize Brussels sprouts served whole anymore? These are bright green globes, glossy from a tumble in that duck fat — a relief (I can't believe I'm saying this but this is where we are) from the ubiquitous crisp-roasted-with-bacon variety. There was murmuring from a nearby table about the blackberry soufflé but the "creme brulee of the moment" ($7) won out: a lemon version perfumed with zest rather than the tang of juice, with a bittersweet crackle of caramel to counter the none-too-sweet custard. The chiming of spoons against ramekins was an echo nobody seemed to mind. If you have the luxury of leaving work for lunch (moment of silence for those trapped with a cup of yogurt and some kind of energy bar), consider treating yourself instead of rolling around in the hair shirt of lunch expenditure shame. 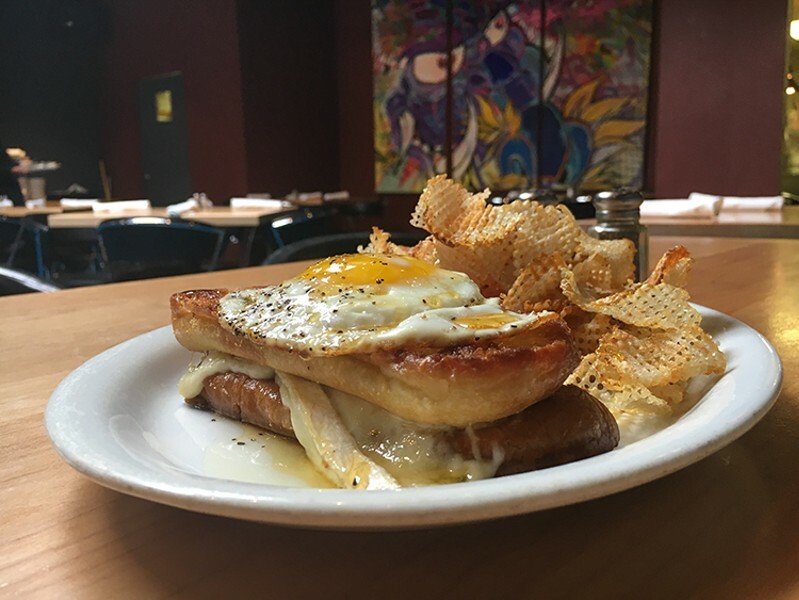 You might try forgiving yourself with the grilled cheese ($10) at Five Eleven (511 Second St., Eureka). Melted brie makes a run for it out the sides of a soft homemade roll that's been grilled inside-out for a buttery, crisp exterior that's close to deep frying without going full Elvis. A drizzle of honey plays against the molten brie, its earthy rind and the char on the bread. The heap of hot gaufrettes, latticed and satisfyingly crunchy, may ruin you for packaged potato chips for a little while, so enjoy them now. The polar opposite is the chilled prawn panzanella ($10), a grilled bread salad with cucumber, tomato, fennel and the zing of radish and red onion, all tossed with a spicy vinaigrette. It's the sort of thing one imagines eating at a fancy spa that doesn't demand you exercise. Continue the vibe with the spring asparagus soup ($4 cup, $6 bowl) that lingers on the menu through late summer. Pale and light, its creaminess is offset with bright lemon that makes it utterly fresh. Jennifer Fumiko Cahill is the arts and features editor at the Journal. Reach her at 442-1400 extension 320 or Jennifer@northcoastjournal.com Follow her on Twitter @JFumikoCahill.